PLUSCO 170 is an epoxy based Thread Lock Compound designed to secure connections without welding. PLUSCO 170 Thread Lock Compound is not affected by vibration, pounding or expansion due to temperature variations. PLUSCO 170 Thread Lock Compound also withstands high breakout torque. PLUSCO 170 Thread Lock Compound does not gall. It provides its own lubrication and makes a leak proof connection. Please use the Make Up Estimator on last Tab to estimate the number of kits you will need. 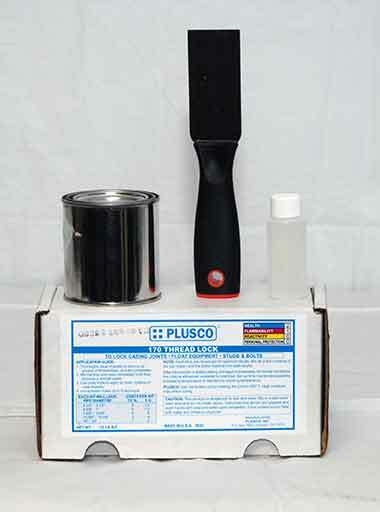 PLUSCO 170 Thread Lock Compound is recommended for locking casing threads tubing joints or other threaded connections without welding.